Location is everything and the Balmoral is in a convenient but serene surroundings with easy access from anywhere in Northern Ireland just off the M1 motorway. Lady Dixon’s and Musgrave Park are picturesque, nearby wedding photo locations. You can be assured of receiving first class service from our wedding co-ordinators who will help and guide you through your planning and will be on hand throughout your special day to ensure everything runs smoothly, allowing you to relax and enjoy the day to the fullest. Our exclusive wedding packages, will allow you to tailor the occasion to suit both yourselves and your guests and will enable us to make your day as individual as possible. The Balmoral Hotel is also fully equipped and licensed to cater for civil ceremonies . Why not download our wedding menus and view options for banqueting, children’s food menu, evening buffet selection and of course our wine list and sparkling wine fountain offerings. If you have further questions please use our wedding enquiries form below. Married Abroad? We can cater for all your return celebration requirements. Please contact hotel for further details and a full copy of our terms and conditions. This competition will see one lucky couple win a £5000 wedding and we are matching that top prize with another £5000 of wedding prizes for you. TO ENTER simply fill in your details it couldn’t be any easier. Lucky couples will attend our sensational July Gala evening and everyone selected will walk away with a prize. This will be the most amazing night of the year for couples and their friends so watch out for more information and Terms & Conditions. Good luck to everyone taking part and congratulations on choosing the Balmoral Hotel for your perfect wedding day. The prizes are non-transferable and can only be redeemed by winning couples. The top prize of £5k is towards our Ultimate wedding package plus credit towards accommodation. All our standard terms and conditions for our wedding packages are applicable as per wedding brochure. Entries to the competition close on by 5pm 21st June 2019. Any entries received after will be excluded. There will be one winner of £5k package, a runner up winner of £1k package, seven winners of £500 prizes and a winner of the peoples choice prize to the value of £500. Couples winning a ticket to the final event will be drawn randomly. Each couple selected for the event will win a prize. Couples winning the wedding package prizes must be legally entitled to marry. Prizes are open to be used for weddings, civil ceremonies, humanist ceremonies, renewal of vows and other reasonable wedding related requests meeting our general terms and conditions. It is a pre-condition that the winners agree to the use of their names and images to be used for press coverage, and any reasonable requests made by the Balmoral Hotel for publicity purposes. Failure to agree or participate will result in forfeit of the prize. The Balmoral Hotel reserves the right to amend these terms and conditions at anytime without prior notice and any amendments will be published on the Balmoral Hotel website. You are advised to regularly check the website for any changes. The Balmoral Hotel reserves the right to cancel, modify or suspend the competition at any time. Use of a false name or address will result in disqualification from the competition. The products and services forming the prizes have been agree in good faith by the Balmoral Hotel and by the suppliers of the prizes. The Balmoral Hotel accepts no liability or responsibility for the provision of, or failure to provide, any products or services, nor does it accept any liability or responsibility for the provision of, or failure to provide, any products or services from a supplier or any third party agent. No cash alternatives, or any product or service, will be provided to the on offer prizes. Provisional bookings for venue hire will be held for 14 days. If the deposit, booking form and signed agreement are not received within the specified time we reserve the right to sell the date. An initial £500 deposit is required to secure the booking. It is non-refundable and non-transferable. A second payment of £500 is required within 12 weeks from the date of the provisional booking. A further payment of £1,000 is required six months prior to the reception date. These payments are non-refundable and non-transferable. Not less than two weeks prior to the reception date, a final detail meeting will be held with our event planner. At this meeting all specific details will be confirmed, including final numbers. The final balance will be calculated and must be paid in full. The final numbers represent the minimum numbers of guests that will be catered for. Should the number of guests reduce, money paid is non-refundable. In the event that you require additional guests to be added, we will endeavor to facilitate such a request but cannot guarantee that additional numbers can be catered for. Any additional costs must be settled on acceptance of the request. All prices are correct at the time of print; however they are subject to price fluctuations. Rates are inclusive of VAT at the prevailing rate. The Balmoral Hotel reserves the right to vary the price and fare. You will be notified of any price variations. The Balmoral Hotel reserves the right to cancel the booking if scheduled payments are not received by the agreed dates. 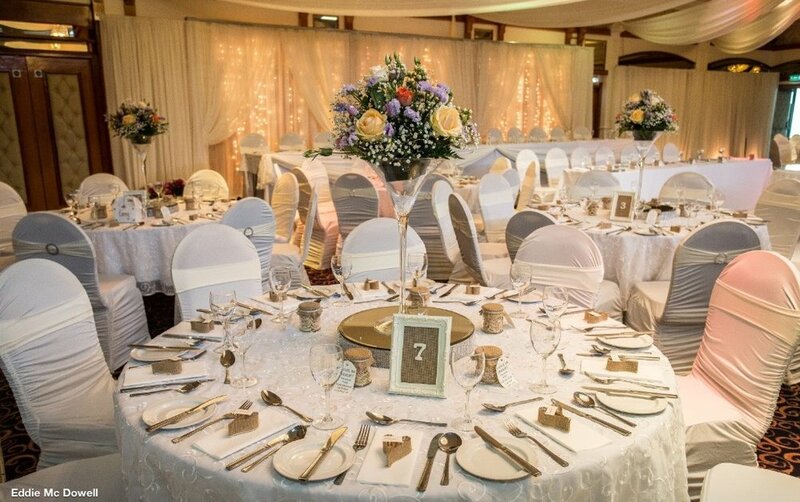 Wedding receptions can only be booked by the bride and/or groom (or partners), for whom the reception is held. They shall enter into the contractual arrangement with the hotel management for provisional bookings, final deposits and final number confirmations. Photographic ID will be required and a copy retained on file. If you require us to hold a bedroom allocation for your guests, each room must be named and confirmed with credit card details. Should any guests fail to show on the day, the full room rate will be charged to your account. Accommodation is subject to availability. We can only accept credit cards to hold the rooms. You are responsible for any and all damage caused to The Balmoral Hotel by you and your guests. The reasonable costs of repairing any such damage must be paid in full to The Balmoral Hotel. All food and beverages will be supplied by The Balmoral Hotel. Corkage is not permitted. You will be charged for any alcohol consumed by your guests that was not purchased on the premises. Any inappropriate behavior may result in a guest being removed from the premises and charges may be incurred. The Balmoral Hotel reserves the right to close the bar and terminate the music if the situation demands it. Any items related to the wedding must be removed on checkout. The Balmoral Hotel is not responsible for damage or loss of gifts or supplies to the wedding. All wedding cakes can only be delivered on the morning of the wedding. The Balmoral Hotel is not responsible for your wedding cake. The Balmoral Hotel is not liable for any failure or delay in providing any facilities, service, food and beverages as a result of events or circumstances outside of our control or in the event of forced majeure. Due to alcohol licensing laws and health and safety legislation we advise that persons under the age of 18 cannot stay on any licenced sections of the Hotel, to include the function room, Lady Anne, Greenan Bar, Lobby Bar and Stix & Stones than 9.30pm. Cancellations must be confirmed to The Balmoral Hotel in writing. Should we not be informed of your cancellation in writing, The Balmoral Hotel will look to recover any financial losses incurred. • Cancellation from date of booking up to 6 months before the wedding, 100% of deposit will be charged. • Cancellation from 6 to 3 months before the wedding, 100% of deposit plus 10% of estimated bill will be charged. • Cancellation 3 to 1 month before the wedding, 100% of deposit plus 25% of estimated bill will be charged. • Cancellation 1 month to 2 weeks before the wedding, 100% of deposit plus 50% of estimated bill will be charged. • Cancellation less than 2 weeks before the wedding, 100% of deposit plus 75% of estimated bill will be charged. If the contact details taken at the time of the booking change it is the responsibility of those booking the wedding to inform The Balmoral Hotel. Failure to do so may cause The Balmoral Hotel to cancel your booking. Weddings are expensive and for this reason we recommend that you take out wedding insurance to cover any unforeseen events.